Stork Thermeq has had its engineering factory in the centre of Hengelo, in the Dutch province of Overijssel, almost since time immemorial. It is a beautiful location, but nowadays is no longer entirely practical. 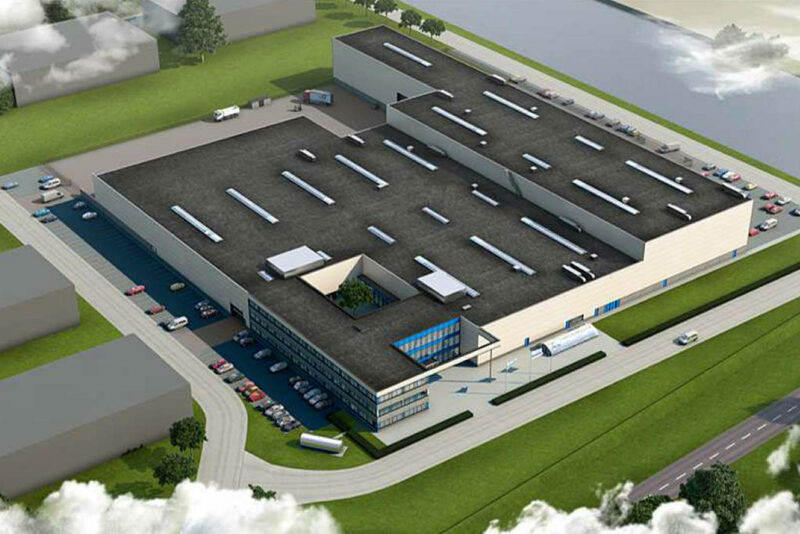 That is why Stork is relocating to a new building in Hengelo’s Kanaalzone. Kamplacon is providing the roof and wall constructions for this building. The new building comprises 15,000 m2 of industrial space and the cladding for this production facility is being provided by Kamplacon. We are equipping the building with a warm roof construction using profiled steel roofing sheets, some of which are perforated. Sendzimir galvanisation has been used for certain sheets and an aluminium-zinc coating for others. The external walls are made up of horizontal steel structural liner trays, which have also been Sendzimir galvanised. We are filling these liner trays with a mineral wool. For the external finish Stork opted for the colours RAL 9010 and RAL 5015. This new production site forms part of the innovation triangle in the second phase of the ‘Hart van Zuid’ urban restructuring project. Here Stork will benefit from more space and significant transport advantages: freight no longer has to be transported through the streets of Hengelo and bulky materials can arrive and leave by water.